BERLIN, GERMANY -- (Marketwired) -- 08/22/14 -- The Founders of app-discovery search engine Knicket, Uwe Flade, Martin Konradi and Thomas Jung, recently released an infographic that discusses the facts and figures of the mobile app world. These statistics supplement Knicket, which helps people find high quality apps in a simpler way than the official app stores. With 1,230,168 apps in the Apple App Store and 1,299,573 apps in Google Play -- 25% of which are games -- it can be difficult to find the right application for your smartphone or iPad, especially with 40,000 apps being released every month. By 2017, it is expected that there will be more than 200 billion app downloads per year and 94.5% of all mobile apps will be free. 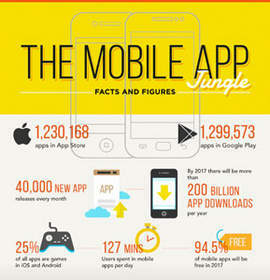 This is significant as the average person spends 127 minutes in mobile apps per day. As far as cost, 62% of iOS and 69% of Android apps are free. Additionally, 38% of iOS and 31% of Android apps are paid. For iOS, 20,000 apps cost more than $6.99, while $1.47 is the average cost, and 32% are in-app purchase. In fact, 76% of Apple's App Store revenue was from in-app purchases in 2013. For Android, 10,000 apps cost more than $6.99, while $3.74 is the average cost, and 42% are in-app purchase. Knicket has helped over 750,000 users since its launch and the app search engine community is continually growing, with users in 193 countries. It's currently available in English, German, and French. Clearly, Knicket is largely popular, and growing in popularity every day. In fact, Knicket is on track to be offered in 11 different languages in 2015. You can find the apps you need with this easy to use, filter and tag based search engine for applications. It's pointless to waste valuable time scrolling through an app store when you can discover the next app to make your job easy, in a matter of seconds. Knicket is very unique and has proven to be successful by the large volume of users.